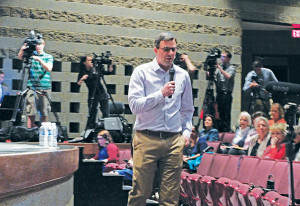 U.S. Rep. Justin Amash told the crowd at Cedar Springs High School Monday night, April 10, that the partisanship in Washington is the worst he’s ever seen, and that the leadership doesn’t seem to be interested in breaking the gridlock. “I’ve always said that we need to work with each other, have honest debate, and let things fall where they may. The only way you fix it is by choosing a speaker of the house who is non-partisan. It takes tremendous will, and I haven’t seen that with this or the previous speaker,” remarked Amash. The town hall meeting was the first of several that Amash is holding throughout the district over the next week. He explained that the only things that go to the floor for a vote are the things that the leadership wants, things that have no chance of passing, or things too mild to affect anything. “We either need a change in direction from this speaker, or we need a new one,” he said. Amash is a firm believer in the principles of the Constitution. He is known for not only standing up for those principles, but also for not mincing words when it comes to politicians he feels are violating them, such as President Trump. That was the case with the President’s recent strikes on Syria. Amash explained that the War Powers Resolution is often used to justify one-off strikes. Those cases are supposed to only happen when the U.S. itself has been attacked. It says: “The President’s powers as Commander in Chief are exercised only pursuant to a declaration of war, specific statutory authorization from Congress, or a national emergency created by an attack upon the United States” (50 USC Sec. 1541). Amash said the framers of the Constitution left it up to the people to decide whether they want war, and the president then conducts the war. He did say he thought they should continue to go after ISIS, but that they should update the 2001 mission and goal, and have more debate about it in Congress. “I don’t think you can have perpetual war; it’s dangerous,” he said. He said that there is no reason to rush it. “We want to make sure we get it right. They just wanted to get it done quickly. It was just a political plan. I’m part of the Freedom Caucus, and I’m sure you heard that we caused it to fail. It’s not true. There were more Republicans going to vote against it than were part of the Freedom Caucus.” Amash said that 50-80 Republicans would have voted against the bill. 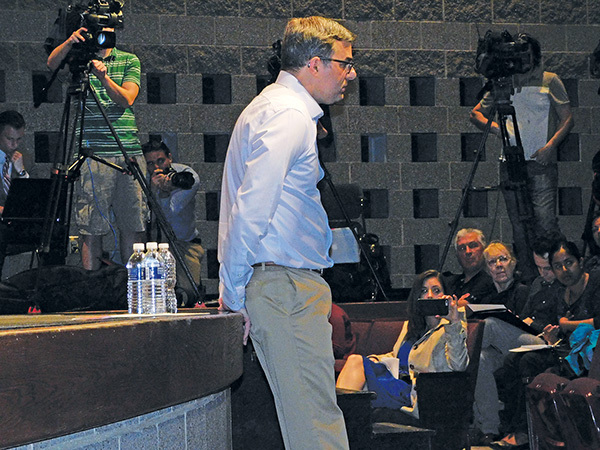 “It would have been actually very embarrassing, and that’s why they pulled it,” Amash said. After the failure of the bill, an aide to President Trump called Amash a liability over Twitter and urged Trump supporters to vote for a different Republican candidate in 2018. But Amash isn’t letting that sway him. “We should’ve worked with the Democrats on it. It needs to be bipartisan. We need buy-in. I still believe the best system is to let states regulate health care. They have different people, different demographics. Allow them to try out a variety of ways. There would be more alternatives, more choices, and would cause the least amount of tension. If you didn’t like it, you could move to another state. I think it would be easier to move out of state than out of the country,” he said, which brought a chuckle from the crowd. Amash touched on several other topics including immigration, Internet privacy, education, the presidential transparency act, and more, and answered questions for two hours. He also encouraged residents to let him know their feelings on possible war with Syria, and to reach out to his office if they have problems, such as veterans getting assistance, immigration issues, and other concerns. You can contact the Grand Rapids office at (616) 451-8383 or send physical mail to 110 Michigan St NW, Suite 460, Grand Rapids, MI 49503. 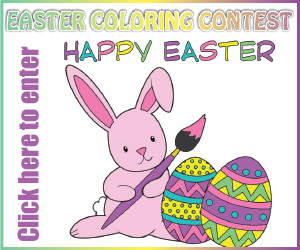 You can also email him through his website. Visit https://amash.house.gov/contact-me.